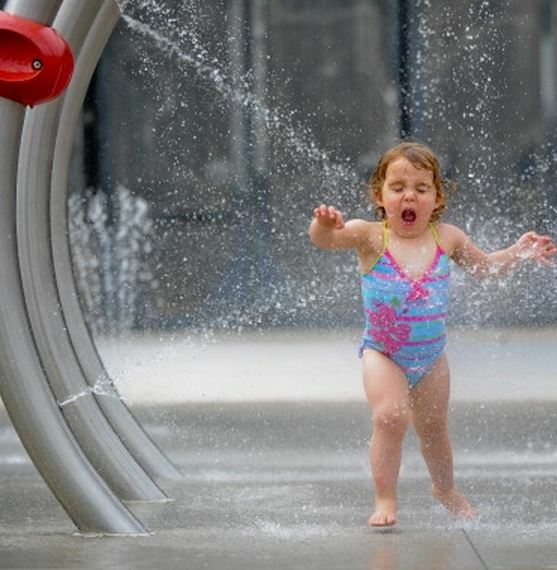 Splashpads are a central point for families and kids. Splashpads have been at the top of the most requested additions for parks for the last few years and this trend is only increasing. Splashpads are a zero-depth aquatic solution suitable for a variety of age groups that combines the sensations of different water effects such as flowing, misting and jetting. With no standing water, Splashpads are a safe aquatic play activity. There is virtually no risk of drowning. The City of West Bend Wisconsin constructed a Splashpad next to their wading pool and saw attendance increase by 111% over the year preceding the installation of the Splashpad. The low maintenance and installation costs when compared to a pool were important factors in the decision to put in a Splashpad. Another example of the increased attendance and usage was seen by the Town of Cottage Grove Minnesota. Having opened just this summer, the staff had been monitored usage regularly and found that in the first 2 months alone, over 9,100 users used the Splashpad. As a comparison, last year 5,700 people used the outdoor municipal swimming pool over the course of the entire summer. Without admission costs to residents, being able to come and go as they pleased was seen as a great advantage to the Splashpad®. Located near other playground amenities such as courts, trails and fields increased usage of all park facilities as a whole. Installing the Splashpad resulted in creating a central gathering point for the community, encouraging social interaction. Since the Splashpads are inherently safe without any standing water, adults are free to enjoy the outdoors without the need to constantly supervise their little ones.